Floral and fruity; this fragrance captures the revitalising aroma of the intricate flowers and refreshing fruits of the passionfruit vine, as it slowly winds its way around sweeping outback balconies and leisurely comes into bloom. 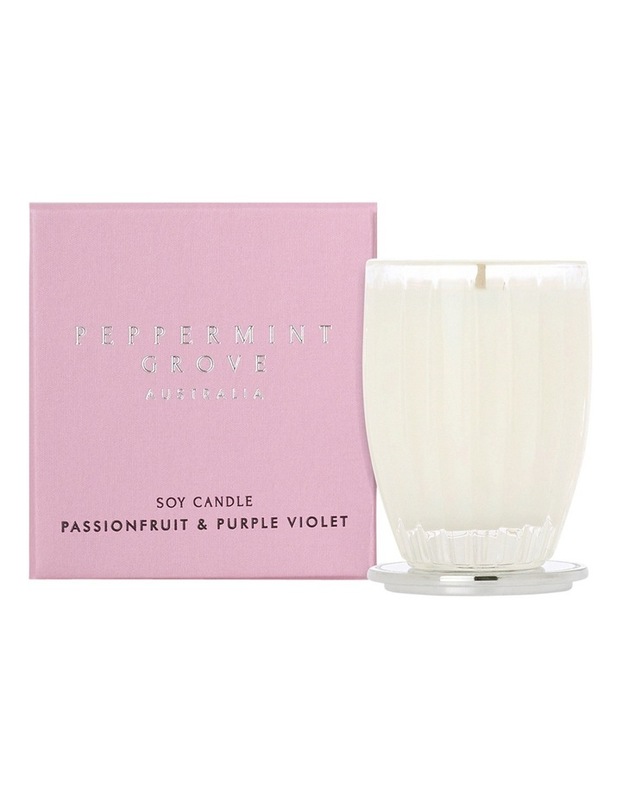 Peppermint Grove soy candles are handmade in Australia. They are poured in a highly polished custom-designed glass and feature a polished silver lid that also acts as a protective barrier for surfaces. Top notes are passionfruit, orange and bergamot; middle notes are violet, jasmine, rose, geranium, cassis and nutmeg; base notes are vanilla, tonka bean, musk and patchouli.